Euphonias are members of the finch family. 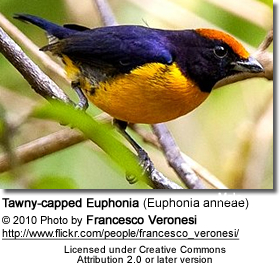 Previously, they were considered to be part of the tanager family, Thraupidae. Most euphonias are dark metallic blue above and bright yellow below. Many have contrasting pale forehead and white undertails. Some have light blue patches on the head and/or orangish underparts. 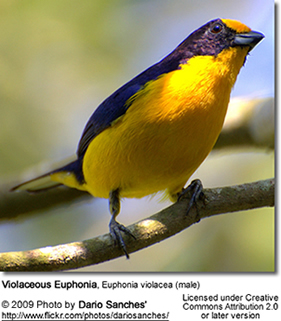 The Yellow-throated Euphonia or Violaceous Euphonia have a yellowish underside and lack the dark throat of the other Euphonias. Their diet consists of a variety of tree-borne fruits. In particular, euphonias are considered mistletoe specialists; however, the degree of mistletoe specialization varies between the subspecies. 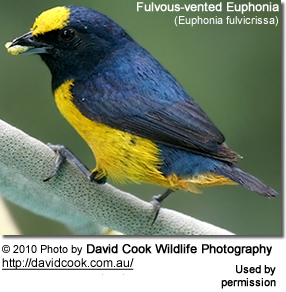 For example, the Blue-hooded Euphonia feeds nearly exclusively on mistletoes, which make up about 80% of its diet. 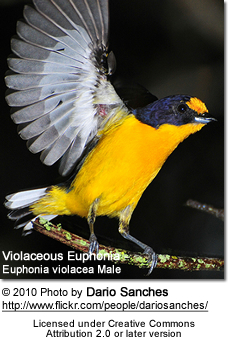 While others, such as the Yellow-crowned Euphonia, with some species from 20 - 80%; with the diet of some species being 80% mistletoe berries, while the Yellow-throated Euphonia's diet is only made by 20% of mistletoe berries. Antillean Euphonias, Golden-rumped Euphonias, Thick-billed Euphonias and Scrub Euphonias are also known to extensively feed on mistletoe berries. 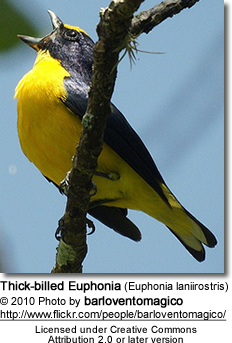 The Euphonia gut is specially adapted for mistletoe berries, which are poisonous. Euphonias defecate sticky mistletoe seeds that cling to tree branches, thus facilitating the dispersal of the parasitic mistletoe plant to different trees.These finches tend to move to places where mistletoe berries are the most abundant. Some species also feed on nectar and insects. They are most commonly seen in small groups foraging in their favored feeding areas. They construct domed fiber or moss nests, with a side entrance that hang in vegetation and bromeliads or are placed into tree crevices or mossy banks. Both parents feed and raise their young. Euphonias are known for their almost constant singing. Their best known calls sound like "Pe-we," :dee,dee, dee," "see-see," "ti ti ti ti" and "beem-beem" - which gave the Yellow-crowned Euphonias the local name "Bim-Bim."